But God chose the foolish things of the world to shame the wise; God chose the weak things of the world to shame the strong. He chose the lowly things of this world and the despised things—and the things that are not—to nullify the things that are, so that no one may boast before him (1 Corinthians 1:27-29 NIV). Sometimes life doesn’t turn out like we expected, and sometimes those twists and turns can eave scars in our lives. So what are we going to do about it? I suggest turning that pain into purpose, that hurt into hope, and that mess into a ministry opportunity. Are you ready to do that? 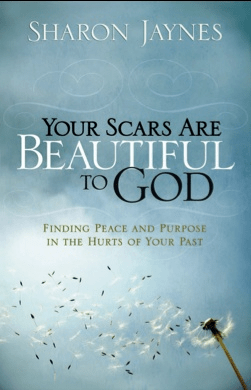 Is so, my book, Your Scars are Beautiful to God: Finding Peace and Purpose in the Hurts of Your Past Can Help. Click on the title to read a sample chapter. And while you are on my site, make sure and sign up for my blog packed with more encouragement and inspiration. You can also follow me on Instagram, Facebook, and Twitter all right there on the homepage.